Douglas Anthony "Dougie" Marillier (born 24 June 1978) is a former Zimbabwean cricketer. He is a right hand batsman known for his unorthodox technique and a right arm offspin bowler. One of earliest popularizers of the "scoop" stroke which is designed to sail over fine-leg, he has a one-day top score of 100, achieved in Sharjah against Kenya in April 2003. He is credited as the inventor of the Marillier shot, in which the batsman extends the bat as a ramp in front of him and flicks the ball over his shoulder to fine leg. It is sometimes referred to as the Marillier. Marillier was born in Salisbury (present-day Harare). His father was a policeman and played cricket for the Harare Police Club and the provincial team. Marillier first played cricket at North Park Primary School, and in his third year he started to play in the Colts side, with boys three years older than he was. His elder brother, Eian, played as a wicket-keeper in a few first-class matches in Zimbabwe and in the UK. Their younger brother, Stephan James Marillier, currently plays for Southern Rocks in Zimbabwean franchise cricket. Marillier attended Eaglesvale High School in Harare and quickly became a key figure for the cricket team there. When he was 16, Marillier played for Mashonaland U19s for the first time. Unfortunately he was confined to a wheelchair for three months after breaking both legs in a car accident and his prospects of playing cricket again seemed grim. After recovering, he returned to playing cricket. Marillier toured England with the Zimbabwe U19 team in 1996 and set a then world record partnership of 268 for the first wicket with his friend Mark Vermeulen When Marillier got back from that tour he started playing league cricket, and his good form there led to his selection for Zimbabwe B. He did not play for a while but when he did he played very well, hitting 108 against Border B. In 1998 he played for Kenilworth in England, hitting 1207 runs in 98, followed by 1218 in 1999. Marillier applied for and was accepted by the CFX Academy in 1999 and the following year he was accepted into the Australian Cricket Academy. When he returned Marillier hit a hundred for the Academy against the New Zealanders in a one-day warm-up game, and this led to his selection for the full national side for the ODI series. Marillier made his debut in place of Craig Wishart in the second match. The first ball he faced was on his legs and so he flicked it away for three, which settled him. He put on 83 for the first wicket with Alistair Campbell before pulling a long hop to midwicket for 27. Their stand was a major reason why Zimbabwe won the match. In the third game he scored 47, in a partnership of 97 with Campbell. Zimbabwe next travelled to Nairobi for the International Cricket Council Knockout Competition, but unfortunately the team had already been selected, so Marillier was unable to go. He was naturally a member of the following overseas trip, the extended tour of Sharjah, India, New Zealand and Australia. Opening the batting in five One Day Internationals, his highest score was only 11, but the tour selectors persevered with him, putting him down to number seven, where he scored 38 against India. He also made his Test debut against New Zealand, scoring 28. His lack of consistency meant that he did not play in the triangular tournament in Australia, which also included West Indies, until the final match. 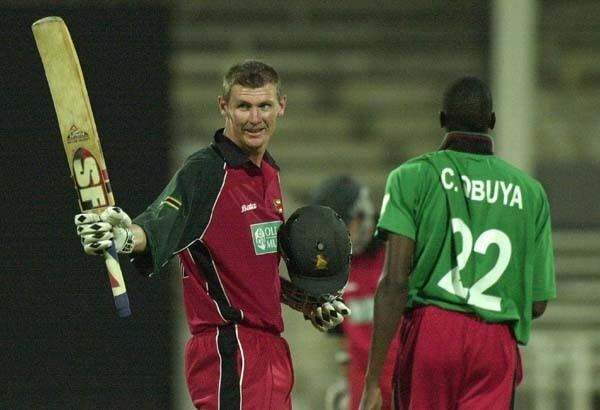 He could hardly have had a more testing experience, as a fine Zimbabwe batting performance after Australia scored over 300 meant that he came in at number seven needing to score 15 in the final over, bowled by Glenn McGrath, to win the match. He moved across to the first and third balls he received from McGrath and flicked them over his shoulder to fine leg for boundaries, reviving hopes of an incredible Zimbabwe victory. But he was just unable to complete the job, and his team lost by one run. His two courageous and unorthodox boundary strokes did win him respect, with the shot becoming known as the Marillier shot. Back in Zimbabwe, he did well in the Logan Cup, captaining the Midlands team and scoring two centuries to average 55. However, this was down the order, as he decided his technique was not tight enough for him to open the innings. Despite his domestic success, he failed to keep his place against Bangladesh, and decided to take up a club appointment in England rather than stay at home and hope for selection against India and West Indies. He might have had a match or two, in fact, as Zimbabwe suffered from injuries, and had he been available he might have played in the final Test against the West Indies instead of Hamilton Masakadza, who hit a century on debut. He won back his place in the one-day side against England, but failed again with the bat; it was surprisingly his bowling that kept him in the team, after he took four wickets for 38 against England at Bulawayo and continued thereafter to bowl his flighted off-breaks usefully. After scoring 19 runs in five innings, two of them opening, he broke through with 52 not out at number six against Sri Lanka in Sharjah, followed by 37 in Pakistan. Marillier continued to do reasonably well for the national side. In 2002 he "Marilliered" Zimbabwe to a famous win in India in an ODI with a 56* at the death, although this time he used the shot against Anil Kumble. In the same match, he broke the record for the fastest fifty by a Zimbabwean, reaching that landmark in just 21 deliveries. Marillier set the record for becoming the first ever batsman to score half century when batting at number 10 position, when he did it in 2002 against India.It was remained has the highest ODI score by a number 10 batsman in ODI history for about 7 years, later it was surpassed by Mohammad Amir.Marillier's 56* remains the third highest score at number 10 position by any batsman and the highest for Zimbabwe at no 10 in ODIs. He made the side for the World Cup but did not do well. After the World Cup however he had an excellent tournament in Sharjah, taking wickets as well as scoring 100 against Kenya, his first international hundred, as an opener. In England however Marillier had a bad form slump and lost his place, although his tight bowling in tandem with Ray Price was a key factor in Zimbabwe's only ODI win, over England at Bristol. He did not play for the national side again, with first Wishart then Barney Rogers preferred to him as opener. Just before the rebellion Marillier announced his retirement from cricket. However he has since return in action in domestic cricket. Marillier's international stats do not do him justice really; he averages 31 in Tests with two fifties, although it has to be said both came against Bangladesh, and in ODIs his batting average is only 18 (but he can be a match winner on his day) and 41 with the ball, with 30 wickets. In first-class cricket Marillier averages 37 with 6 hundreds and 13 fifties. With the ball he averages 37 with 46 wickets. In Domestic One-day cricket his batting average is 25, 3 hundreds 9 fifties and 40 with the ball taking 56 wickets. Marillier's last domestic commitment was for Zimbabwe A against Pakistan A in 2005. After that he did not play any official cricket. He is currently working in the Real Estate in Zimbabwe and also play some social cricket there. In 2009, he turned out for 'Red Lions' in the Zimbabwean Winter Premier Cricket League and it was believed that he was a player to return through franchise system. But after the introduction of franchise cricket in Zimbabwe, that does not seem to be the case for him along with another former Zimbabwean player Campbell MacMillan.